The Chevrolet Camaro claimed the 2012 muscle car sales title even though the popular GM muscle car posted a decline in sales from the 2011 calendar year and in January 2013, the Camaro again posted a decline in sales but the General still sold enough Camaros to comfortably beat the Ford Mustang and the Dodge Challenger in the first month of the new year. 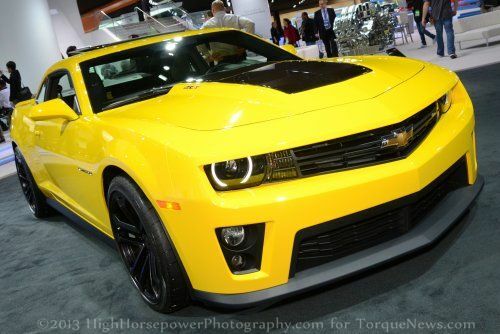 More importantly, the Camaro already has a lead of over 1,300 units in the first stage of the 2013 muscle car sales race. The Chevrolet Camaro moved 4,925 new models last month which allowed the Camaro to be the top selling performance car in America. Being on top of the segment is nice for GM but the company cant be happy that sales of their muscle car slid by almost 14% compared to the first month of 2012. The Camaro finished the 2012 calendar year with an overall decline of 4.4% with quite a few months during the course of the year showing a decline in sales compared to the same month one year earlier. While the Camaro has been able to maintain a big enough lead to win the muscle car sales title three years in a row – claiming a fourth straight title in 2013 will become harder yet if sales numbers keep sliding for the Camaro. Ford sold 3,608 examples of the mighty Mustang in January 2013 and along with falling short of the Camaro, the Mustang also fell short of the sales figures from the first month of 2012 by 3.4%. After seeing sales improve by 17.8% during the course of 2012 only to fall 1,100 units short of the Camaro for the 2012 sales title, a decline in January sales was surely not how Ford hoped to begin 2013. The good news for Ford is that January was the Mustangs worst month in 2012 so there should only be good news on the horizon as the Mustang and Camaro battle through 2013. The Dodge Challenger was once again in third place in terms of muscle car sales for January but with 3,497 units sold – the brawny Mopar muscle car improved by an impressive 37% and managed to climb within 111 units of the Ford Mustang. January was also the worst month for the Challenger in 2012 so if this fast start to 2013 is an indication of what is coming for Dodge in the new year, the Challenger could post some great figures in 2013. The Chevrolet Camaro has won the muscle car sales title each of the three years since being reintroduced for 2010 but with the next generation of the Ford Mustang expected to arrive in April of 2014 – things could get a whole lot tougher for the Camaro in the future. This could be complicated by the rumors that the Dodge Challenger is also expected to undergo a refresh that should make it smaller and more competitive with the Mustang and Camaro. While the new Challenger and new Mustang might not make a big difference to the Camaro right away, GM will need to figure out a way to get the Camaro growth headed in a positive direction. In the meantime – the Chevrolet Camaro is looking to make a run at being the bestselling muscle car and performance car in the US market for the 4th straight year.